and the highest entirelywithin the country (Kangchenjunga being on the border of India and Nepal); owing to this geography it was the highest known mountain in the world until computations on Dhaulagiri by western surveyors in 1808.The Pindari glacier is nearly 50 km from the Saung, which is the starting point to trek the Pindari, Kafni and Sundardonga glacier. 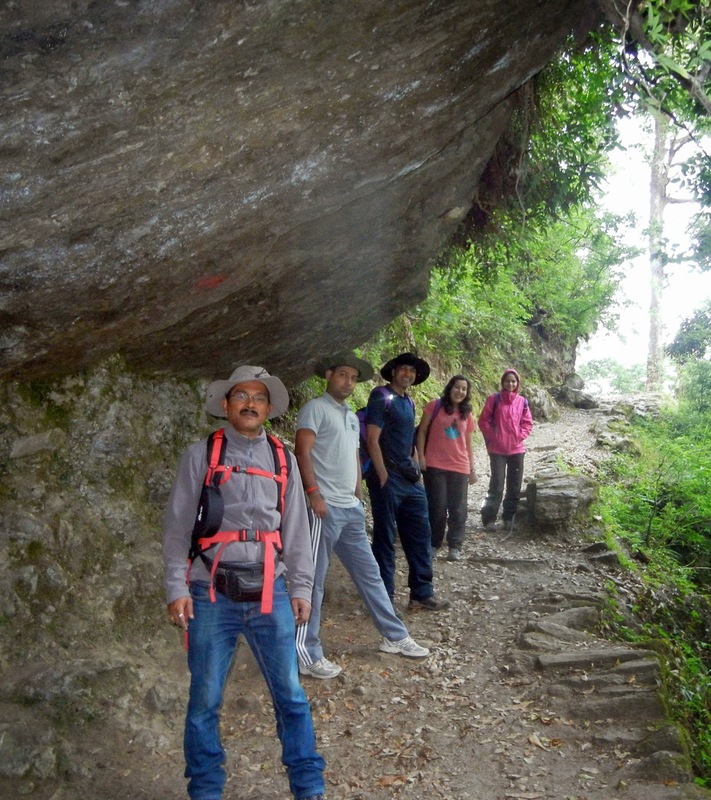 We opted for the 'package tour' trek offered by KMVN (Kumaon Mandal Vikas Nigam). Broadly speaking, in the package trek, they do the trip planning, they setup porters to carry our luggage, so we just have to bring ourselves and be able to walk. We went from Delhi to Kathgodam by train. This was a 7 hrs of journey. Night halt at Kathgodam KMVN guest house and in the early morning next day we ran away to Bageshwar by a Bolero. The distance from Kathgodam to Bageshwar is 179 kms. It took 6 and half hrs. That day also we stayed at Bageshwar KMVN guest house. 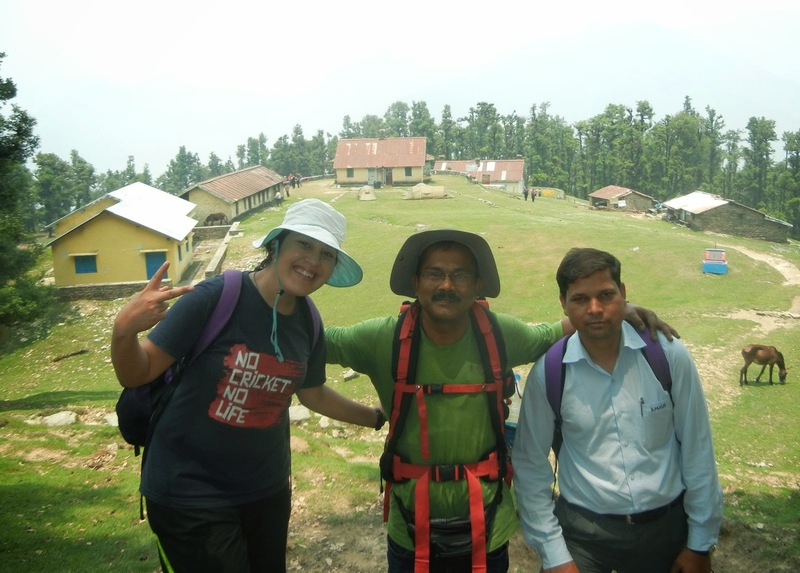 Day 1, June 7, 2014: Morning 8.45am, after breakfast we left Bageshwar KMVN guest house. We traveled from Bageshwar to Saung by a trekker alongside the river Saryu enjoying high ravine. After traveling 2hrs, we reached Saung at 10.45am. Saung is a small village at a distance of40km away from Bageshwar. It is situated at 985mtr high altitude from sea level. Our trek started from this Saungto Loharkhet at 11.00am. From Saung to Loharkhet we trek 3km road at the elevation of 45 degree inclined and it was 1760mtrhigh altitude from sea level. After trekking almost 2 and half hrs we reached the Loharkhet at 1.30pm. We were hosted by KMVN people and had lunch there, nice hospitality. We did not have any more plans for that day, so we played Kabaddi and Khoo-Khoo and we halted at Loharkhet (KMVN) guest house. Day 2, June 8, 2014: In the morning after breakfast we started at 6.00am. From Loharkhet to Khati it was a tremendous trek of 18km amidst the pine, Rodrendon (Brush), Eucalyptus, Raghu, and Kharsoo. After trekking 10km of jaggy road we crossed Dhakuri pass (2940mtr).We reached at Dhakuri guest house after 1km sloping downward. Dhakuri is a beautiful place, a lap of the mighty Himalaya`s Sivalik Range. It is under the Kapkot biodiversity forest reserve of the Bageshwar district of Uttarakhand. There are Beautiful Forest rest house, KMVN rest house and PWD rest house which was made by British in 1860. We had lavish lunch with fresh local vegetables, rice and fruits at guest house. After taking a little bit of rest again we started trekking to Khati at about 2.00pm. Still we had to trek 7kmof jaggy road to Khati. In between Dhakuri to Khati we crossed Washam, Kherni and Omula Village respectively. These all small villages are under Khati Gram Panchayat. Mentionable that Khati is the last village of this frontier area. This is a beautiful village lying on the bank of Pindar Ganga. There are only a few families of 150 houses and having only one communication facility of BSNL. But I had neither seen a tower nor could I talk to my family. Also there was no any electricity facility. At night they use solar system power supply acquiring by themselves only. At last6.00pm we reached the Khati KMVN guest house (2210mtr). Night halt at Khati KMVN guest house, but there we slept below the open sky at the lap of mighty Himalaya even though there was furious cold. Day 3, June 9, 2014: We started trekking from Khati to Dwali at 6.00am alongside the river Pindari. However we met the river Pindari from Kherni Village yesterday. This was a horrible day for us. From the very beginning of the trek we had seen the catastrophic of the cloud bursting of Uttarakhand, which was occurred in 16/17th June, 2013. We couldn’t believe our eyes. There were three bridges on the river Pindari and Kafni. One was on the way to Dwali and another two bridges were in the confluence of the river Pindari and Kafni. This place is near to Dwali guest house. Our Guide informed us that within a few moments those three bridges were washed out by the destructive flood of the Cloud Bursting of Uttarakhand. At that time I remembered the theory of Malthus on population incrassation- “when the population increase in the world then natures automatically balance it by natural calamities like earthquake, flood, drought, famine etc.” Calamites disturbance of Uttarakhand make the trek very very harder and longer as well as jaggy and ruggedness. However, today we trekked 15km road. Earlier it was only 11km. We trekked 15km road in9hrs and at last we reached Dwali (2575mtr) at 2.30pm. Day 4, June 10, 2014: Morning 7.00am, we started from Dwali. Same as yesterday’s trek, sometimes up and sometimes down. But, yet it was fully different from yesterday’s trek. Here we crossed some waterfalls and some moraines (a small glacier).One can easily hear running water below the moraines as you walk across the frozen stream. As well as so many landslide areas we crossed, whole the path we enjoyed the beauty of Himalayan Arum plant, like Cobra lily (Bhalun Bank). Cobra lily is the common name of several plants. The name derives from the resemblance of the flower to the hood of a cobra. We witnessed varieties of Fern, Cactus and beautiful flowers of Rhododendron (Brush) etc. We trekked 5km only from Dwali to Phurkiya. After completing the 4hrs of fabulous trekking we reached Phurkiya (3250mtr)at 11.00am. Night halted at Phurkiya guest house. Day 5, June 11, 2014: Phurkiya is the last outpost of KMVN. Tremendous cold waves were running there that day. It is a marvelous place, just sit out and you can see the clouds go by. But it had a hostile and arid feeling. The air feels thin and it feels distinctly hard to do physical exertion. However, we wake up at 4 am. 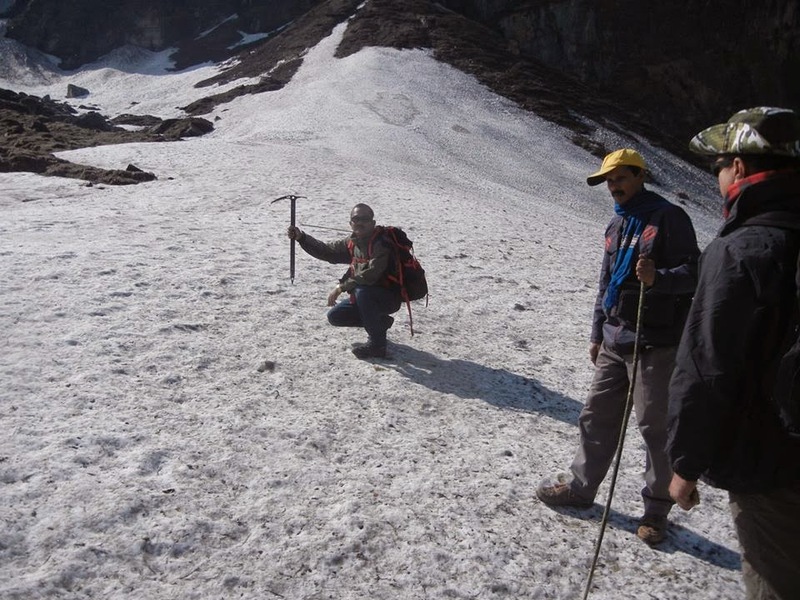 After finishing the morning chores we came out from guest house and had our breakfast-fresh poha, cornflakes, boiled egg, milk and move for Pindari “Zero” point (Glacier) as soon as possible. Because, abruptly there arises heavy wind and sometimes may be cyclone with snowfall after 10/11am. So we had to return back from Pindari before 11am. From the guest house we had seen the beauty of Mt. Nandakot, Mt. Nandakhat and Mt. Pawli dowar’s Golden peak. As the first ray of the sun touches the mountain looks very beautiful. We forwarded as possible as quickly. More than three moraines and one waterfall we crossed. All were agitated with thrilled. Before reaching the “Zero” Point there awaiting another surprise for us. That is Pindari Baba’s (Dharmanand Giri) Ashram, which was built himself, a lovely Ashram. It’s an amazing place. Anyone can assemble tent here with the help of Baba. But unfortunately Baba was not there. One day back he left to Khati. Notable that Baba is the only person who lives alone in the Mandir (Nandadevi Mandir) from the Khati village which is 27 km away. He serves all the travelers tea and snacks, sometime halwa etc. From here we can see the snow-capped Peaks. At last we reached “Zero” point(3820mtr)at 9am and hoisted our ONGCHA flag. After detaining 2hrs at Pindari “Zero” point we came back to Dwali with an unforgettable experience. It was a marvelous trip for us.